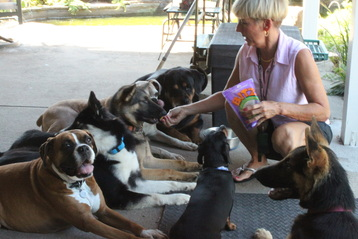 Pam Cundiff, retired service dog trainer teaching the 'down' command (below left) to a group of 7 all at once. VIDEO ABOVE IS COMMAND FOR RETIRED SERVICE DOG BREEZE, AN ADOPTED RESCUE, TO PICK UP A PURSE AND OTHER ITEMS TO BRING TO ME. SHE'S OLD AND ACHES SO SHE HAD TO BE COACHED ALONG. <VIDEO TO LEFT IS OF HER PICKING UP A PENNY WITH HER MOUTH AND HANDING IT TO ME. I APOLOGIZE FOR BLAMING MY BABY GIRL WHEN SHE PICKED IT UP THE FIRST TIME AND I DROPPED IT! 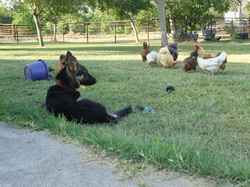 "I'm learning not to chase chickens!" 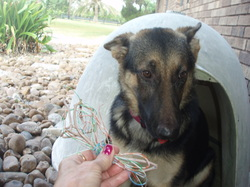 "I wish I hadn't chewed the wires."